Come and enjoy all the amenities Lake Vallecito, Colorado has to offer while staying in this beautiful two bedroom 1 1/2 bath house that is located right on the lake, near the marina. Sit in front of the large fireplace, or barbecue on the deck, or just lay in bed and enjoy the amazing views that the San Juan mountains and the lake have to offer. The master bedroom has a jacuzzi bath tub, and a small private deck. The kitchen has been updated and has tile flooring and counters, a dishwasher, and a separate laundry room. 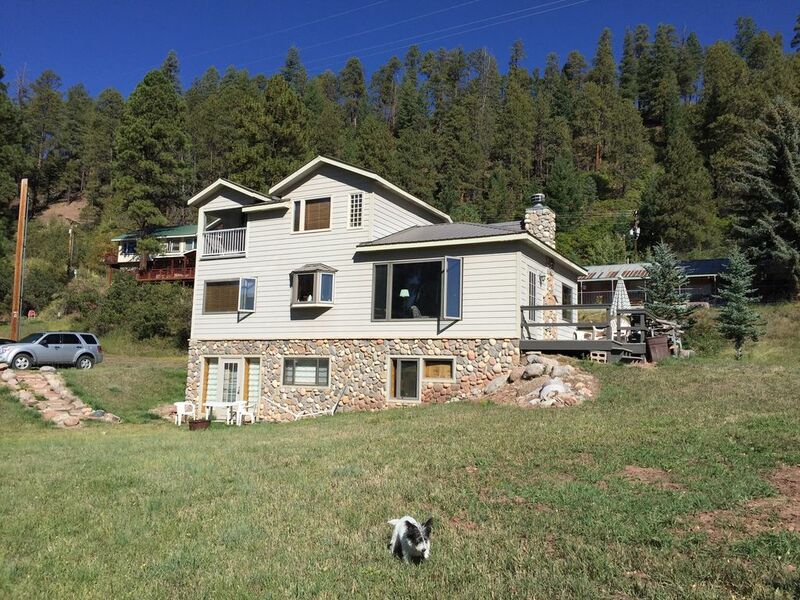 If you enjoy hiking, fishing, horseback riding, or boating, this is the perfect location. I always appreciate comments, and I hope you had the opportunity to enjoy the beautiful lake and Durango. Five star home was terrific, sad the lake was low, loved the roadhouse nearby. If there was more water in the lake and maybe a newer gas grill on the deck, I'd give this property Five Stars. The house was full of pleasant surprises and we would definitely stay there again. We still kayaked, fished, grilled dinner, loved the roadhouse a short walk away. We managed to meet family in Durango and took the round trip on the Silverton Train. Part of a great trip- even though storms last July damaged the railroad and lake was suffering consequences of snowfall shortages the previous winters. The master bedroom and bathroom were so comfortable, the kitchen and living area a bit too comfortable for my taste. I'd be camping or at a rustic cottage but my sweetheart has a bad knee and so this home was perfect for us. I can only imagine how beautiful it will be if the reservoir were full of water and those fat trout were on the grill. The house was great. It was clean and had all of the amenities needed. Nice location with right on Vallacito Lake and next to a restaurant/bar if you don't want to cook. My husband and I had a nice stay. Private yet close to everything. The house is upscale and beautifully furnished. Comfy beds, and living room furniture. Everything to cook meals, but the restaurant next door is quite good. I would recommend taking your favorite spices and KPod coffee. Would most definitely stay again. It was a pleasure having you, I hope you come back! This house was so amazing! We were right on the lake and the view was spectacular! The house was very spacious, clean, and had everything we needed (shampoo, conditioner, towels, pots and pans, plates, utensils, keurig etc.). You are close to a small marina where we rented kayaks which was really fun and the water was crystal clear! We had an amazing stay and would visit again in a heart beat! Thank you to your very nice comments! The property is beautiful! We had everything we needed to enjoy a peaceful and relaxing stay away from city living. The lake is clear and has walking trails all around. This is a fantastic place to stay if you want the outdoors with the comforts of home.